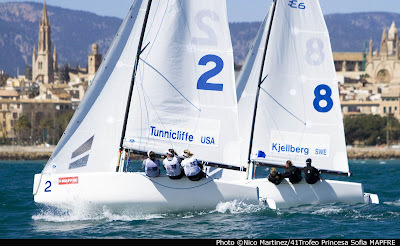 Palma, 30 March.- Finally, after a morning with up to 30 knots of wind and big waves, only the Women Match Race and the RS:X men and women sailed in the afternoon. 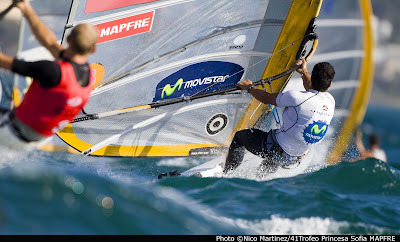 The remaining classes participating at the 41 Trofeo SAR Princesa Sofía Mapfre, event of the ISAF Sailing World Cup, could not sail and after being postponed ashore, the Race Committee cancelled the races of the day around 15:00hrs. The weather forecast for tomorrow looks better. In women RS:X Alessandra Sensini takes the lead in the overall standings with two wins today. British sailor Bryony Shaw is down to second place followed in third place by French competitor Charline Picon. Sahar Zubari keeps the lead in RS:X men tied with Tom Ashley from New Zealand and third place overall is for Greek sailor Byron Kokkalanis. In women match racing, 3 flights of Repechage, 3 flights of Gold group and 2 flights of the Silver group were sailed. The plan for tomorrow is to finish Stage 2-3-4-5. (Repechage, then Gold, then Silver.) Flight 25, 26 (Repechage); 30, 31 (Gold); 34, 35, 36 (Silver) then the leftover match 4 from flight 33 to finish. Stevie Morrison, skipper of 49er GBR 7, and second overall pointed out that this was unusual weather. For Morrison and his crew, Ben Rhodes, “Palma is one of the best sailing venues in Europe” so he looks forward to tomorrow to go out sailing. Tomorrow classes sailing in groups will sail divided in Gold and Silver groups.